In today’s economic environment, many people are paying more attention to their monthly budgets than they have in a long time. One of the best ways to reign in your budget is to get a handle on your spending habits. These tips can also be applied to evaluating your business costs, home expenses, planning a vacation or wedding, or even buying a new home. 1. Take inventory. Many people can name their major expenses, but don’t remember all the little expenses that drain their wallets. To help you get a true picture of your spending, try writing down everything you spend money on during the course of a month. That means writing down not only your major expenses, but also those quick trips to the gas station, grocery store, coffee shop, movie theater, fast food restaurants, and so on. Also, if you pay for insurance or another bill on a quarterly basis, write down what the monthly expense equals. 2. Mark down your needs. Once you have all your expenses listed, it’s time to analyze them. The best place to start is by grouping your expenses using highlighters. For example, you may want to use one color to highlight “must haves” like your automobile, life insurance, utility payments and so on. Next, use a different color to highlight items that may be important occasionally, but aren’t required—such as, new clothes for work. Finally, use a different color to highlight unnecessary expenses that are nice, but could easily be cut out, such as mochas from the local coffee house. Now, you can make some purposeful decisions about what you can cut—starting with the easy items and working your way up to the important but not necessary. Don’t forget, it’s not always “either-or.” For instance, you don’t have to cut out mochas altogether; instead, you can cut down to one per week as a special treat after a busy or productive week. 3. Give yourself an allowance. Sticking to your budget is easier if you have no other option. 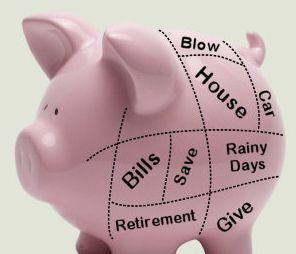 If you have a real spending problem, you may want to give yourself an allowance to live on. For example, try taking out $50 or $70 in cash for each week and putting your credit cards and checkbook in a safe place. That way, when you spend money, you’ll actually see it leave your wallet… which means you’ll see the impact more dramatically. This forces you to make some tough decisions. After all, if you go to lunch on Wednesday, you may not be able to go to dinner on Friday night. It’ll be tough at first. But soon, it will be second nature.